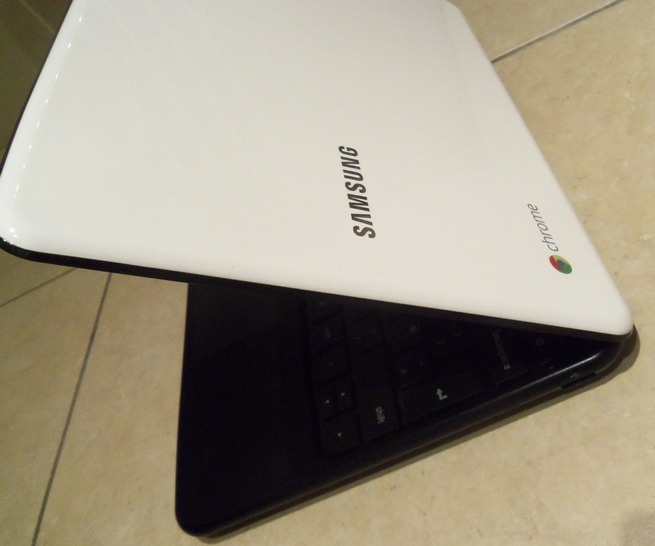 Hands On: Samsung Chromebook - the perfect cloud companion? As Samsung and Google continue their love-in, with the most recent of their offspring being the Galaxy Nexus Android 4.0 smartphone, its hard to predict anything other than future collaborations. It is quite hard to categorise the Samsung Chromebook Series 5, one thing it certainly isn’t is a fully fledged Windows-esque laptop. It’s debatable as to whether it would even be classed as a laptop. I think the best way to describe it is as a glorified, slightly larger than normal, notebook. The strikingly white outer face is almost as dazzling as Simon Cowell’s teeth. It is interrupted by only the metal Samsung and Chrome logos, which rather than looking tacky, somehow manage to add character to the device. Open the lid and you’re greeted with a soft rubbery-plastic surface that is not only practical and durable, it is also more comfortable than your average Dell casing. The keyboard is nothing short of amazing. It’s proportions are excellent, the keys are soft (almost like typing on marshmallows) but, more importantly, they are mounted on sturdy panel that could even withstand typing from Hulk Hogan. Not only would I call it a challenge to accidently hit a key, something which is happens far too often for my liking with regular keyboards, but Samsung have also managed to keep the Chromebook looking neat. 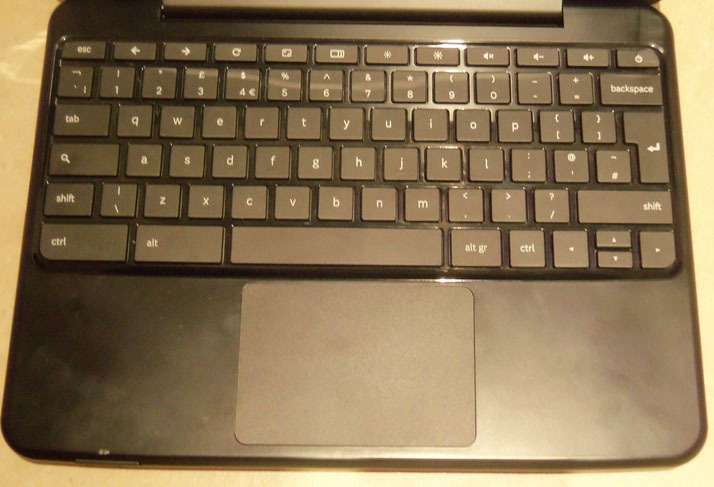 The function keys don’t appear on the Chromebook, instead there is just a row of commonly used quick action buttons i.e volume up/down, full screen on/off and brightness up/down. You’ll be even happier about the quick action buttons when you realise just how bad the trackpad is. 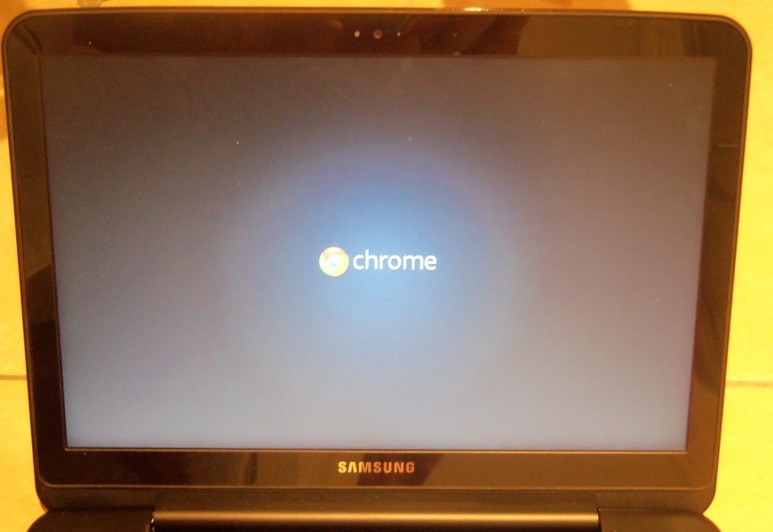 It is the only one thing that ruins the aesthetic of the Chromebook. It’s huge and buttonless, meaning it sometimes mistakes right clicks for left clicks and, almost as annoyingly, the whole thing bows under the tiniest amount of pressure. It feels very cheap. Weighing just under 1.5kg and measuring 11.6″ (W) x 0.8″ (H) x 8.6″ (D) the Chromebook is not astonishingly light but the curved edges and overall thickness, which in comparison to a number of notebooks is diminutive, make it easy to hold and carry rround. 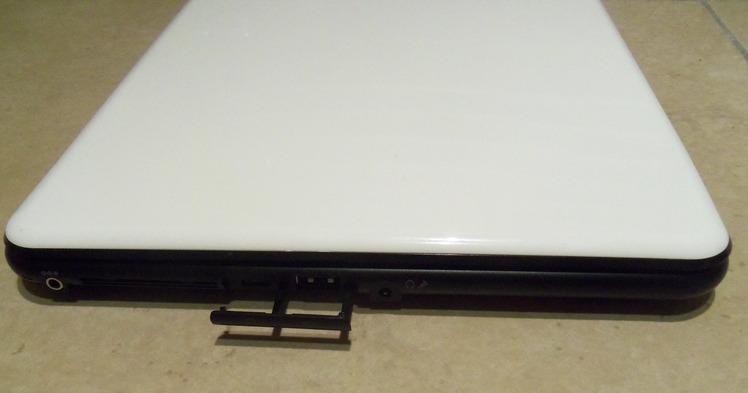 The clean theme continues around the sides of the Chromebook, with the surfaces only being interrupted for a handful of ports. There is nothing around the back and the front only plays host to a SD card slot. The right is where you will find a USB port and behind a plastic door, the SIM slot. There is another plastic door on the left but this one covers the video output and a second USB. The left is the busiest face when it comes to ports because that is also where the earphone and charging jacks are located. You’ll notice there is no Ethernet port, which I think is a bit of an oversight but it may have added what Samsung deem as unnecessary thickness. The 12.1″ LED (WXGA) non-gloss screen with a resolution of 1280×800 is what the Series 5 has to offer. Boy-o-boy is it bright as well, Samsung claim up to 40% brighter than your average Joe laptop. True proof of its capability comes in the fact that it can be viewed from almost any angle and in direct sunlight. Two massive bonuses. The stereo speaker, which isn’t too bad in terms of quality, could do with being louder. The 1MP built-in webcam with mic are also worth a sentence to themselves. The specs of the Chromebook won’t knock your socks off, the 1.66Ghz Intel ATOM Processor N570 and 2GB of RAM power this Samsung device just fine. The 16GB SSD is plenty because the whole point of the Chromebook is that it is the perfect partner for cloud computing. I’ll cover this in greater detail later on. 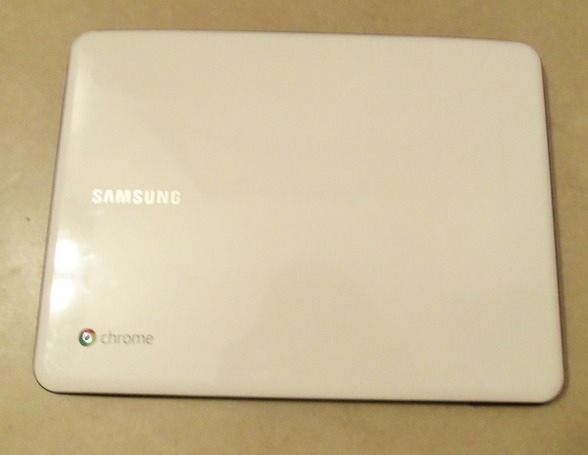 By far the single best thing about the Samsung Chromebook is that it turns on and is firing on all cylinders within a second or so of opening the lid, you don’t even have to touch a button. Google claim battery life of up to 8.5 hours, more than double your standard laptop and not only that, Samsung also claim their battery keeps 80% of its original capacity for up to 1,000 recharges – more than 3x longer than a typical battery. Just as well since it isn’t removable. Amazingly, the 8.5 hours seems do-able. I used it for web browsing, video viewing and sending emails for intermittent periods of time, leaving it on between usage and it barely effected the batter life in the space of three hours, dipping by only 20%. The only other thing you need to know is that it charges at an impressive speed as well. Recuperating around 10% in 15minutes. You’d be wrong if you thought that Chrome OS is just the Chrome Browser, even though that may seem to be the case at a quick glance, after using it for more than a minute it quickly becomes apparent that there is more to the Chrome OS. After logging in, using your Google account of course, (this also syncs your Google web searches, email, calendar and documents) you are greeted with a number of Google apps. The obvious ones come as standard, Gmail, Google Docs and YouTube but there are a couple of newbies, namely a note-taking app called Scratchpad and a game called Entanglement. Don’t worry, I know so far the Chromebook seems pretty limited but the Web Store is here to offer some salvation. There are already some specially formulated Chrome OS apps and tools as well as office favourites, like TweetDeck. Neither videos, other media or files are a problem for Chrome OS, it’s built-in media player and file manager may not be the flashiest or most complicated but they do the job. However, if it were not for Citrix Receiver we may not even be doing this review. Crucially for businesses, the app enables you to run pretty much any app on a Windows Serve r to run within Chrome OS. That means, Outlook, CMS and poto editing suites are all possibilities but bear in mind that the specs of the Chromebook aren’t really built to handle heavy duty programmes. At present Chrome OS is frustrating. More than anything I think it is because I have become accustomed to using Windows or Max OSX but, just as I swapped my IE browser for Chrome, I’m sure, in time, I would become used to Chrome OS. It is still in its early stages and it may well have come ahead of its time with cloud adoption yet to fully take off but the future looks shiny. That’s a pun by the way, because Chrome is shiny. Not so funny now I’ve had to explain it really. 2012 may well become the year of the cloud, Apple’s iCloud should have already made that clear to all those idevice users out there. Google don’t want Apple having all the cloud-related fun and they will surely be hoping that the Chromebook can lead the cloud revolution. The cloud cold be the answer to so many problems, namely physical storage space and hardware, costs and backing-up. The Chromebook also comes Cloud print ready, however it needs to be used with a HP eprinter or print via a Windows machine on the same network using the Chrome browser. Sounds a bit of a faff just to lose a few wires but hopefully this will improve. In truth, I think Google have taken an educated punt here. The Chromebook may take some time before it takes off but I think it is a sign of future portable computing. As it is a new OS, unlike Windows, there are fewer security threats to worry about. Additionally, as there is very little storage built in, the likelihood of losing data is reduced as most of it will be stored or backed up in the cloud. Were it not for the emergence of the cloud and it’s storage capabilities the small amount of local storage on offer here would have spelt the end for the Chromebook. As things stand, you are trading hardware and physical memory for split-second bootime, a light and friendly interface and out of this world battery life. If you, or your business, have already moved to the cloud or are about to then the Chromebook could well be your perfect companion, providing you are already well versed in using the Chrome browser and willing to part with around £399/£349.